The following table shows a summary of these actions. Version of article is stored in Enterprise? A new file is created in Enterprise based on the current article. The new article is opened, the current article is closed. 1 The new version of the article is opened for editing. 3 The article in Enterprise is updated with any changes that were made since the article was last saved in Enterprise. Note: Saving your article locally does not save it to Enterprise. It will only be saved to Enterprise if you use one of the other methods listed below. Use this method to save the made changes to Enterprise while keeping the article open to continue working on it. During this process, a new version of the article is saved to Enterprise. Saved article versions can be viewed and restored by accessing the Show Versions window (Smart Connection > Show Versions...). Note: For more information, see Viewing and restoring file versions using Smart Connection 9. The number of article versions that are stored in Enterprise is limited to a set number (10 by default). This means that when the maximum number of stored versions is reached, the oldest version is removed the next time a new version is saved. This could potentially mean that the version you want to restore may not be available anymore. Be careful therefore with the number of times you save an article. Example: Consider a scenario where the maximum number of article versions are stored: article versions 1.1 to 1.10. The next time the article is saved, version 1.1 (the oldest) is removed and version 1.2 now becomes the oldest version. Note: Enterprise can also be configured to have all minor versions removed as soon as the article is saved to a new Workflow Status. You could therefore see no versions listed when starting to work on a article that has just been moved to a new Workflow Status. For information about configuring file versioning in Enterprise Server, see Saving file versions with Enterprise Server. No change has been made to the article since it was opened or last saved to Enterprise. The article is opened as read-only. The Save dialog box appears. Step 2. (Optional) Change any of the properties of the article. “ ` ~ ! @ # $ % ^ * \ | ; : ’ < > / ? See also: Using duplicate file names in Enterprise 10. Use this method when you want to save and close the current article as it is and continue working on a copy of the article. Step 2. In the Name box, enter a descriptive name. Step 3. (Optional) Change any of the properties of the article. Choose New Dossier to create a Dossier with the same name as the article and automatically add the article to the Dossier. Choose an existing Dossier to add the article to it. Step 5. (Optional) In the Comment box, add a comment. When a user will next open the file, the comment will be displayed on screen. The current article is stored in Enterprise and closed. It is available to other users for editing. A copy of the article is made and stored in Enterprise. It is opened for editing. When finished working on the article, it needs to be saved to Enterprise and closed. This process is referred to as 'checking-in' the article and makes the article available to other users for editing. Step 1. Choose Smart Connection > Check In Article... . 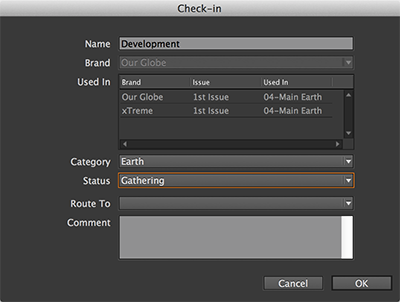 The Check In dialog box appears. Note: When the article is not yet saved to Enterprise, the Save As dialog box appears instead. See Adding an article (template) to Enterprise using Smart Connection for InCopy. Step 2. (Optional) In the Name box, modify the article name or leave the original name. The settings for Brand, Issue, and Category cannot be changed. Step 3. (Optional) Change any of the remaining properties. Use this method when you know beforehand that a connection to Enterprise — typically over the Internet — is not available, for example when working while commuting or when on location. This method is known as 'taking the article offline'. During this process, the article is saved locally and remains checked-out of Enterprise so that other users cannot edit it. Choose Smart Connection > Close All for Offline Usage. Articles that you have taken offline can be accessed by choosing Offline in the Search menu of the Smart Connection panel. Figure: When choosing 'Offline' in the Search menu of the Smart Connection panel, all articles that you have taken offline are shown. To bring a article online again, simply open it when a connection to Enterprise is active. 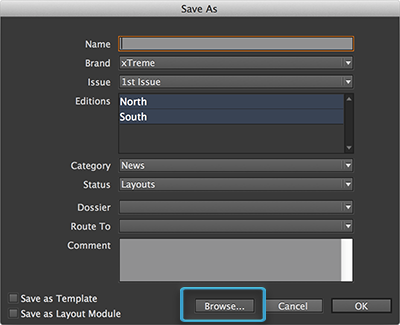 Use this method when you want to save the article locally for future use. Step 1. Choose File > Save Article As... . Step 2. 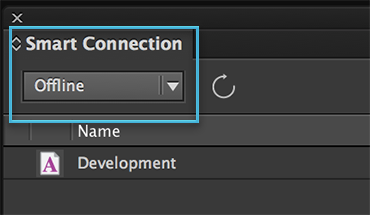 Click the Browse... button at the bottom of the dialog box. Step 3. Browse to the desired location and click Save. The file is saved as a .wcml file and kept open for editing. This method is known as the 'abort check-out' action. It closes the article and returns it to its last saved state in Enterprise: the state after checking-in the article or after saving a version of the article. The difference with regular save actions is that no version of the article is saved. It thereby prevents that different versions of the article exist in Enterprise that are in fact identical. Choose Smart Connection > Abort Check Out. When no changes were made, the article is closed immediately. Are you sure you want to close this file without saving the made changes? Use this method when you want to close the article without bringing up the Check In dialog box. 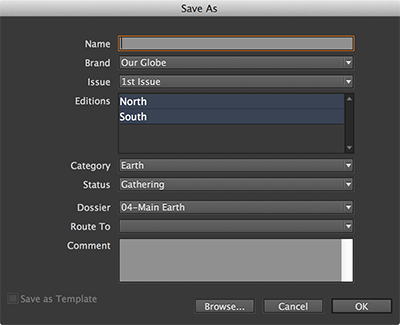 Save changes to the Adobe InCopy document "<document name>" before closing? 22 October 2018: Added information about invalid file name characters.